As previously reported on PNNL's news site. Several scientists at the Department of Energy's Pacific Northwest National Laboratory were recognized recently for their role helping to stem the Ebola epidemic in West Africa two years ago. 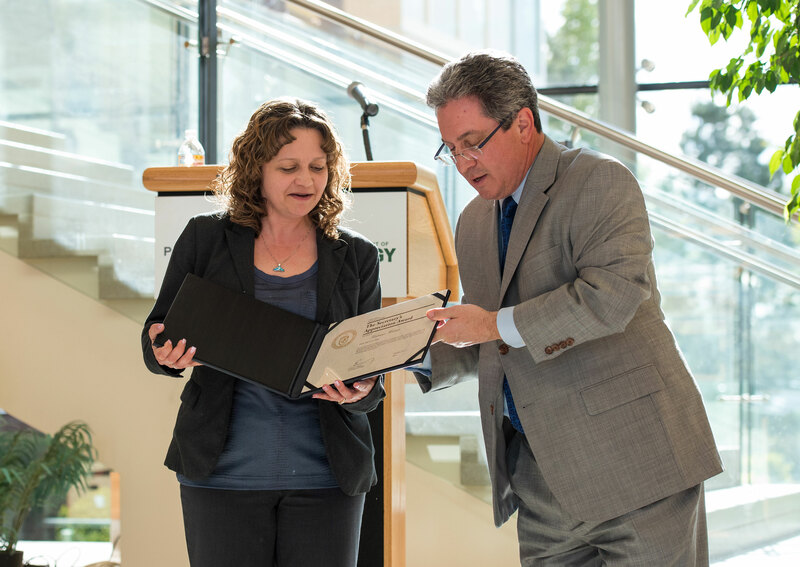 Mary Lancaster, Kabrena Rodda, Mike Spradling and Katrina Waters were honored with the Secretary of Energy's Appreciation Award at a recent ceremony at PNNL. The award was presented by Dimitri Kusnezov, chief scientist of DOE's National Nuclear Security Administration, and Laboratory Director Steven Ashby. The four led a PNNL team which drew on the lab's strengths in fundamental biology, infectious disease, data analytics, emergency response, epidemiology and systems engineering during a critical time in the summer and fall of 2014, soon after the World Health Organization had declared an international health emergency. Ashby noted that "You tackled an unprecedented challenge with passion, courage and dedication. You clearly went beyond the call of duty to support our nation's response to this historic epidemic."